Indoor climbing walls are a great place to try climbing. Photo: Alex Messenger. Climbing gyms (or ‘walls’ for short) are one of the easiest and most practical ways into climbing. 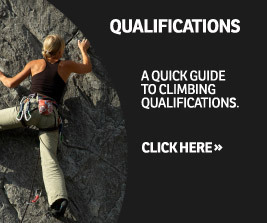 They help you improve quickly and can also be great fun – whatever your climbing ambitions! If you’ve never been to a climbing wall before, your first visit can be both intimidating and exciting, and there are a few basic skills you will need to learn before being allowed to climb unsupervised. Most indoor walls now require beginners to do a taster session, an introductory course or to be supervised by an experienced friend, so if you’re thinking of starting you should first call your local wall and find out when these are offered, how long they take, and what they involve. Such sessions are one of the best ways to learn the ropes, and help ensure that climbing walls are as safe as possible for everyone. Your instructor will show you crucial skills such as how to correctly put on a climbing harness, how to attach yourself to the rope, how to belay another climber and how to safely lower them to the ground once they’ve reached the top. They might also cover warming up, basic climbing moves, how to use the different types of handhold and foothold, and how to use a bouldering wall. The wall will usually lend or rent you equipment for your beginner's course. Once you’ve shown that you can use the wall safely and that you understand the centre’s rules, you will be allowed to register to climb unsupervised. Unless you’re bouldering this means you’ll need a friend to climb with, but many walls will have sessions where you can meet other climbers. And once you’ve got used to climbing at one wall, you’ll also be able to register at hundreds of others, usually just by answering a few questions and signing a declaration that you are responsible for your own actions. Once you’ve done a handful of sessions, you might want to start thinking about buying your own shoes, harness and belay device. Many indoor walls also have gear shops where you can get advice. Be honest about your ability and aspirations – you’ll have plenty more opportunity to buy things if you make the leap to climbing outdoors. If you’re under 18 and want to take up indoor climbing, different rules might apply and you should call your local wall to check. Many offer courses and competitions especially for young people but you might need parental permission or supervision. If you are a parent, or a young person, you may also find our Young People booklet helpful. You can also order our Climbing Walls Essentials DVD. Don't want to miss out on the climbing competition action? Whether you're a competitor, spectator or volunteer, sign up to the climbing calendar mailing list to get reminders for comp registrations, and start times here. Find all upcoming competitions here. Are you new to climbing? Or maybe you fancy giving it a go for the first time? Then you need a copy of our brand-new special edition magazine, called Get into Climbing. This one-off publication for beginners is now available in our online shop. We hope you’re all looking forward to Round 2 of the Youth Climbing Series 2019 this Saturday 26 January.